Acer Aspire ATC-605-UR51 is a budget priced with mid-range features desktop such as a Haswell Intel i5-4460 processor (6MB cache) at 3.2GHz to 3.4GHz speeds with turbo boost, 8GB DDR3 dual channel UDIMM RAM memory, very generous 2TB SATA3 HDD at 5400rpm rotating speed for multitasking and Windows 10 operating system with nice new features like more integrated security than before and faster boot-ups with the InstantGo. 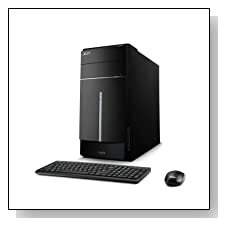 As this is not an All in One machine it doesn’t include a monitor but a modern USB keyboard and optical mouse combo with a decent ergonomic design and the graphics card is Intel HD 4600, which performs better than the HD 4000 and 4400. Four audio you have the HD Audio with 5.1-Channel Support for almost studio quality sound output but you will need decent external speakers or on your monitor. Matte black chassis with metallic finish Acer Aspire looks sleek and modern, weighs 20.42 pounds and measures 16.29 x 6.89 x 14.98 inches. It has all the connectivity options you may need, such as a 16X DVDR/RW SuperMulti Drive, 802.11bgn wireless, Bluetooth 4.0, Gigabit Ethernet with RJ-45, SD Media Card Reader, 2 x USB 3.0 ports at the front, 4 x USB 2.0 ports at the rear, an HDMI output, a VGA port, Headphone and Microphone jacks- Audio Line In and Out and PCI Express x1 Slot, PCI Express x16 Slot, and Mini PCI Express Slot as expansion slots. Intel i5-4460 is quite a capable processor with a Passmark benchmark score over 6600 at the moment and is more than enough for daily tasks and very demanding stuff like photo and video editing and heavy multitasking with the 8GB memory that can also be updated to 16GB for very advanced multitasking but will not be necessary for most people. As you may have noticed it is a 4th generation Haswell CPU rather than a Broadwell or a Skylake released this year but you should still make no mistakes about its performance levels, it sure is fast and powerful but if you want the latest of everything you will find alternatives through the same product page on Amazon.com. For advanced gaming you will need at least a mid-range dedicated graphics and the Intel HD 4600 is quite all right for an integrated card. 2TB is a lot of storage for those that save a lot of multimedia and regular files and the 5400rpm is OK speed- not slow read and write times but not as fast as a Solid State Drive. As a downside there is quite a bit of junkware and you may need to install those you won’t use and for those that intend to get this for playing very demanding current games should look at other options and spend much more too. It runs beautifully for everything else other than advanced games: Decent visuals and image quality, good sound, suitable for multiemedia editing and some level of gaming (Intel HD 4600 being up to 60% faster overall and 30% in gaming performance- you can play the older titles at high and newer titles at low settings). It looks good with its current, stylish and user friendly design with some ports at the front and a top flat surface for putting your peripherals. 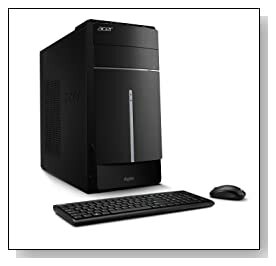 You are getting a very decent set of features for your money and hence it is well worth looking into at the right price and one year limited parts and labor warranty by Acer as well as toll free technical support are included.